Given the quality of my photography, most would be wondering why I did this rather than how! 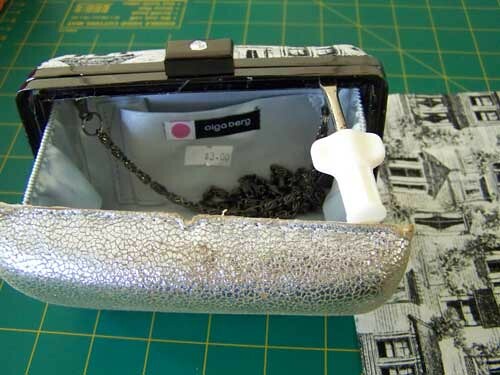 Trust me, the outside of this little hardshell purse was worn and tired, but the inside was pristine. So I pulled the shell sides out of the metal frame, but not completely apart because the inner fabric holds it together as well, and I was keeping that. It looks better in person. It involves glue on fingertips. One recommends cleaning glue off before touching computer mouse. Here’s a better view of the tatty outer, neat inner with proof of op-shop cost, and cute french print fabric. Any marks on the metal are glue or photography errors, it’s a lovely shiny dark grey. Looks great. Did you shorten the chain too? You aren’t he only one to do the sticky fingers – there’s an araldite finger print on my laptop keyboard! Cute fabric! 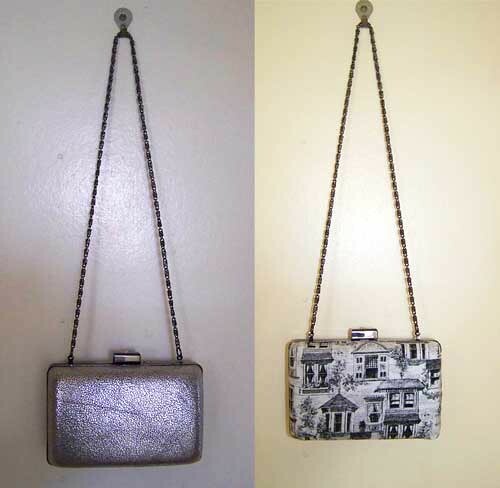 Very impressed with your ability to do this with hard-shell purses. Yeah…. cos I NEVER get chocolate on MY keyboard….